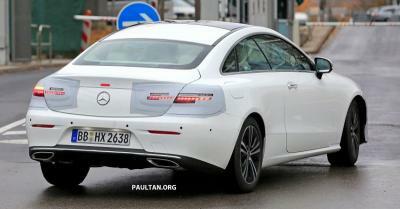 In 2017, Mercedes introduced OLED Taillight in its Mercedes 2018 S-Class Coupe and Convertible cars, and it seems that the German auto maker is now aiming to use OLED taillights in another model - the upcoming C238 E-Class Coupe was spotted in Stuttgart - with a new OLED taillight design. The 2018 S-Class Coupe and Convertible used OLEDs produced by LG Display, and each taillight module contains 33 individually controlled red OLED panels. In the new C238 E-Class Coupe, it seems that each module uses 16 red OLEDs.